Construction cranes crowd the sky in downtown Toronto, completely reshaping the city's skyline. 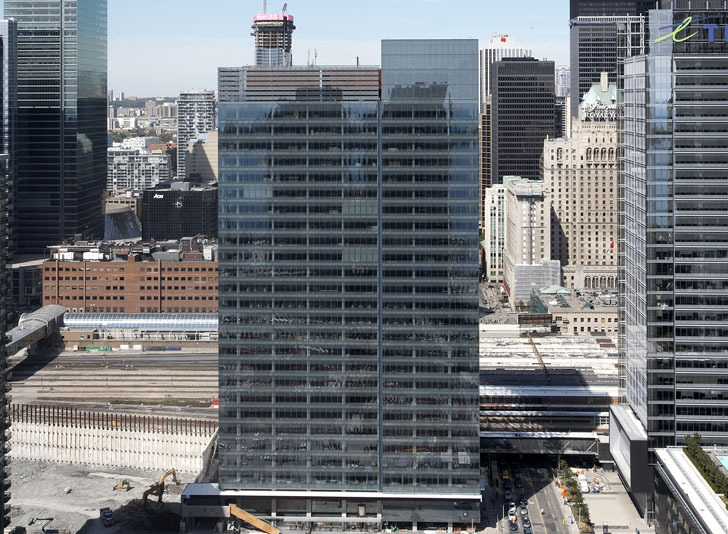 At the center of it all stands PwC Tower, one of the greenest new office buildings in Toronto. The unique building features shared, "hotel-style" office space, making the building more flexible and efficient. And the building's third floor features what can only be described as an "urban forest," an 8,000-square-foot green roof that's planted with large trees and shrubs. 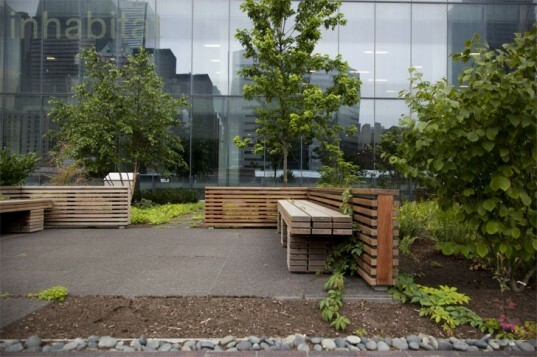 The urban forest is essentially a large-scale intensive green roof that helps to reduce the building’s heating and cooling needs while preventing excess stormwater runoff. Additionally, the building features a greywater retention system, using rainwater for non-drinking applications. PricewaterhouseCoopers (PwC), which occupies 16 floors of the tower, decided to reuse and refurbish much of its existing furniture before moving into the new facility in late 2011. KPMB Architects designed the 26-story tower, and it is expected to earn LEED Gold certification. The smart building is equipped with photo and occupancy sensors that enable the building to reduce energy use through daylighting and conservation by up to 40 percent. It also features a deep lake water cooling system. The tower is located just one block away from Union Station and it contains bike racks for more than 100 bicycles in the underground parking lot. The exterior of the building features high-performance glazing and building envelope to reduce energy needs. The urban forest is essentially a large-scale intensive green roof that helps to reduce the building's heating and cooling needs while preventing excess stormwater runoff. The urban forest is located just outside the building's lounge and dining area, and it features outdoor seating and grilling areas. Additionally, the building features a greywater retention system, using rainwater for non-drinking applications. KPMB Architects designed the 26-story tower, and it is expected to earn LEED Gold certification. The smart building is equipped with photo and occupancy sensors that enable the building to reduce energy use through daylighting and conservation by up to 40 percent. The building also features a deep lake water cooling system. Dimmable lighting and occupational sensors enable to building to take advantage of natural daylight and save energy on lighting. The tower is located just one block away from Union Station and it contains bike racks for more than 100 bicycles in the underground parking lot. PricewaterhouseCoopers (PwC), which occupies 16 floors of the tower, decided to reuse and refurbish much of its existing furniture before moving into the new facility in late 2011. One of the most interesting aspects of the building is the way in which desks are shared. "You make a reservation, just like a hotel," explains project leader Mary McGrath, who led the tour.